October | 2013 | Half Heart. Whole Life. Biggest challenge to having Grant home? Lack of sleep…oh yeah…I forgot that babies don’t sleep. So not only were we sleep deprived, we’d either take turns going to the Hospital, or would work finding people to watch the two boys while we went to see Nolan together. Grant is a sweet, chill baby, though, and we love him to death. It was good to get him out of NICU and home where he belongs. If you have other kids, a major challenge when having an heart baby is being as much of an all-inclusive parent as possible. 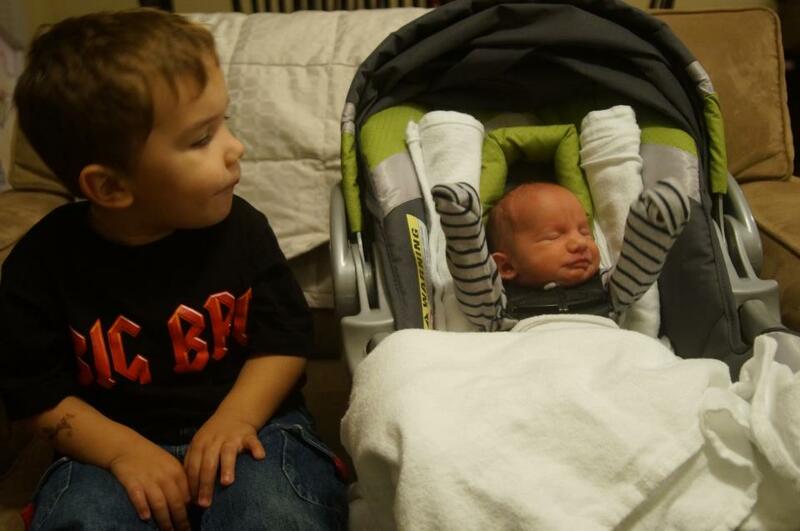 In our case, the twins were both in the NICU and our oldest was with a variety of friends and family early on. What made things crazy was after a few days, Bekah was discharged from the hospital, but obviously our twins were going to stay there. This made things really difficult because we wanted to be at the hospital, and now we’d have to drive 30+ minutes to be there. It was my wife’s awesome idea to go do something fun with Hudson since we had both been M.I.A. for the whole week. At first I was so-so about the idea since I didn’t want to miss anything with the twins while they were in the NICU, but I didn’t want Hudson to feel left out. As the older brother, he had a big job to do, but he definitely needed some attention too. So the plan was for Bekah to head down to the NICU for the day and I would do some fun stuff with Hudson before going to the NICU later in the day. That sounded like a good plan to me, but I couldn’t decide where to take Hudson. I did some scouring on the interwebz and found the NC Transportation Museum, which is about an hour from us and featured a lot of trains, which is one of Hudson’s obsessions. 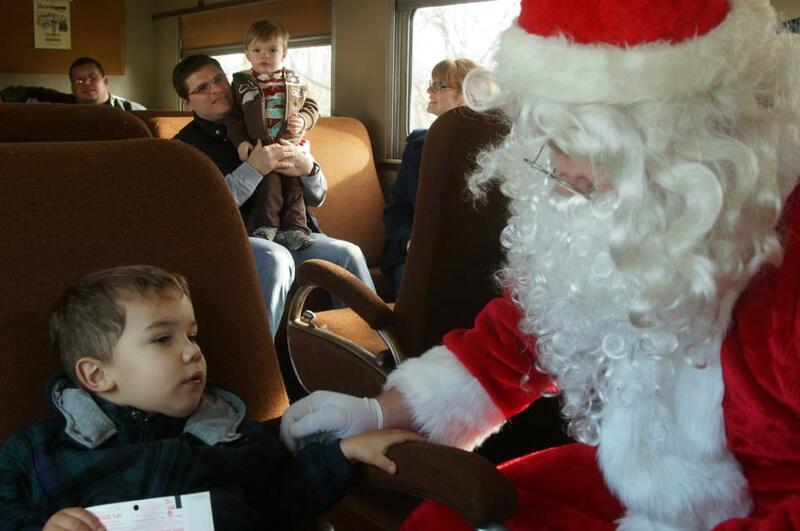 Even better, I found out you can ride one of the trains with a visit from Santa! So I ordered tickets for the both of us and the next day woke Hudson up and told him I was taking him somewhere special, but that it was a surprise. As most 2 year olds would be, he was super-excited. We hit the road with enough time to get there for our scheduled train ride. The whole way Hudson kept asking where we were going and I kept telling him it was a surprise, which kept exciting him. I have to tell you, it was a welcome distraction from everything that had been going on and I was really happy to spend time with Hudson. As we got closer to the museum, we got off the exit and went over a few train tracks before pulling into the museum grounds. 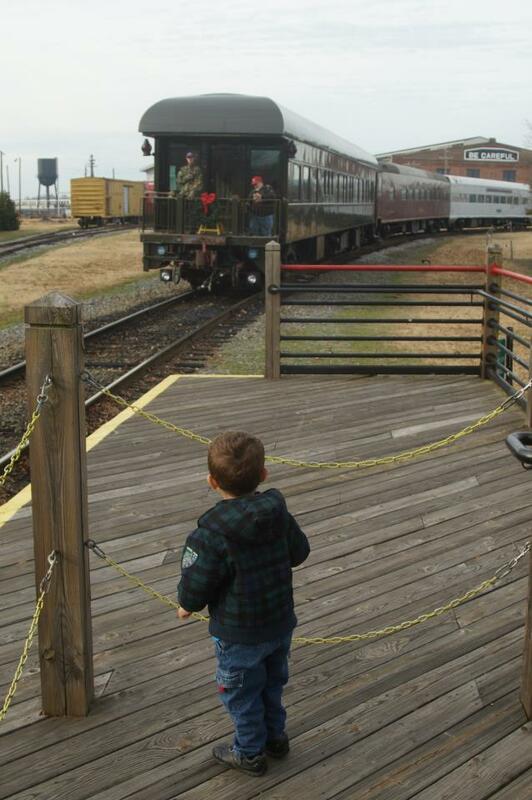 Hudson was happy about all the train tracks and then said, “Daddy, I wish I could see a train.” I parked the car, turned around in my seat and said, “Well guess what buddy…you’re going to ride on a train!” And his reaction was PRICELESS. He gasped loudly and had this HUGE smile on his face. I’ll never forget it. Then I told him “Oh yeah, and you’ll be riding a train with Santa!” and he went NUTS. The conductor helped us aboard and we found a seat before our tickets were punched. 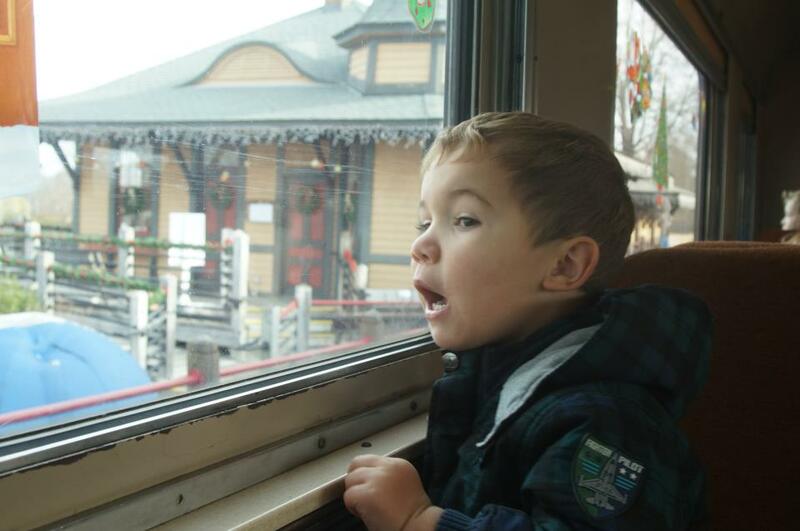 As the train started, Hudson was the happiest I’ve ever seen him. Finally they announced Santa was on his way, and he arrived to the train in this old-school police car. Hudson got a candy cane from Santa’s elves and got to meet Mrs. Claus before the big man himself showed up. 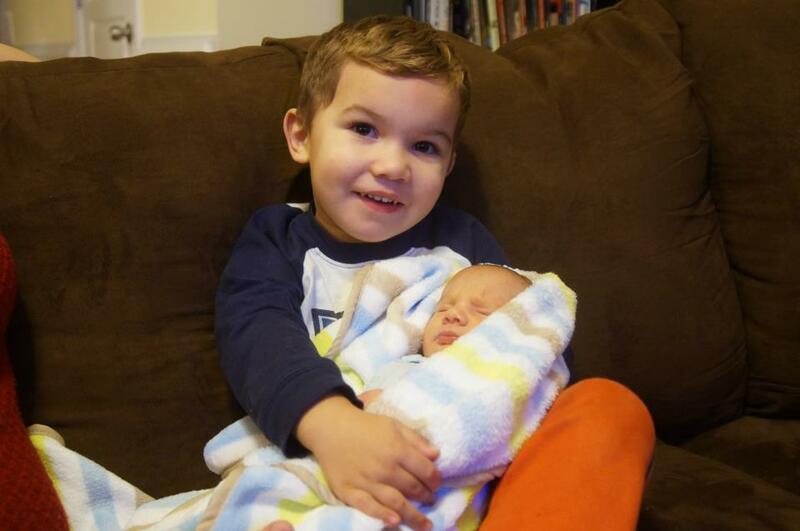 He asked Hudson what he wanted for Christmas…Hudson, being Hudson, clammed up and said nothing lol. I started to talk to Santa and Mrs. Claus about Hudson’s new brothers, and finally Hudson opened up and chatted a bit. Santa gave Hudson an orange, which is apparently a tradition from the depression era: kids would see Santa on a train and he would give them a candy cane and an orange. We spent the next few minutes riding the train and then exploring the museum. Then we went to Steak n Shake for a yummy lunch before heading back on our way. While I was there, I got some good news: Grant was going to be going home! So instead of heading back to the house, I was headed to the hospital so Hudson can meet one of his brothers for the FIRST time! I gotta tell you, it was an awesome day. Hudson’s joy brought me joy and it was good to get into the Christmas spirit…especially since the thought of Christmas barely crossed my mind that week. And to be honest with you, I think I got more out of that little trip than Hudson did. It was refreshing and I just really needed it. It’s always going to be a challenge to balance the needs of a heart baby with those of your other kids. The only advice you can offer is just try your best. You’re going to be exhausted, you’re going to be emotional, you’re going to be frustrated. But never forget the other kids: take time out to do special things with them and make them feel special too. After a couple days of both boys being in the NICU, we were told that we were going to speak with the surgeon. Well we already did that, right? Well yeah, we did meet Dr. Peeler, but this time we’d meet the other surgeon, Dr. Maxey. My first thought was “Ok, what can he tell us that we don’t already know?” but we agreed. Dr. Maxey chose to meet us in the NICU so we could be close to our kids…definitely a nice first impression. He was very kind and personable and pulled up a chair and said, “I’ve cleared up my schedule to be sure I give you all the time you need to have your questions answered.” WOW! That’s pretty special, right? So Dr. Maxey gave a quick rundown of what HLHS was, which we were pretty good with, and then began to describe the initial surgery, which was called the Norwood Procedure. He was very, VERY clear that the Norwood Procedure is a very serious open-heart surgery. It is intricate and challenging and a baby’s heart is roughly the size of a quarter. A QUARTER. How the heck do they do surgery on that?! Then he said something that absolutely wrecked me: nationally about 20% of kids (1 in 5) do not make it through the Norwood Procedure. Oh my God. BUT, he said, he and Dr. Peeler have a ton of experience on the Norwood and do each Norwood Procedure together. He said their rate of success is 97%. Whew, that’s much better. But…what if Nolan ends up as that tiny 3%? How would I cope? What would I do? Is that even fair? Dr. Maxey was such a nice guy. He did a great job of reassuring us we were in the best place for Nolan, but still reminded us that this surgery was very serious and could take upwards of 6 hours or more. He said sometimes they won’t be able to close the chest post-surgery due to swelling and that’s ok. He said he had time and asked us if we had any questions. I’m not sure if I even asked him any…honestly I was nervous for my son and just as much nervous for myself because I realized I’d never been so anxious in my life. 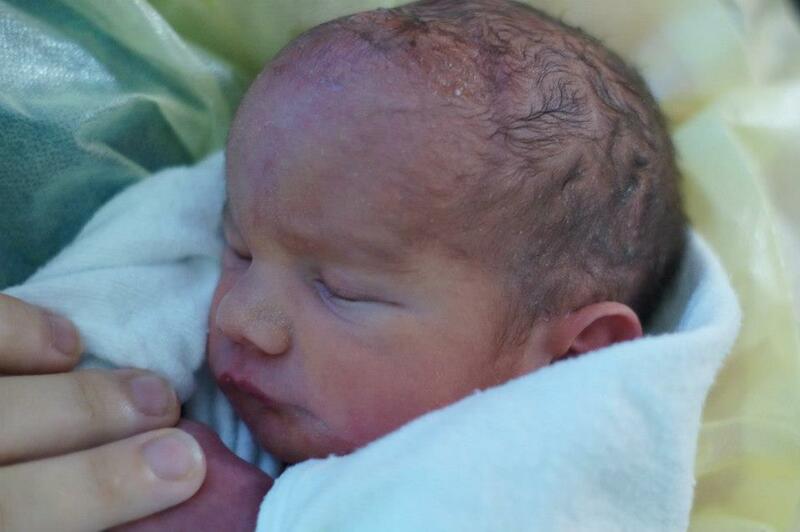 Surgery was set for the morning of December 17th…7 days after Nolan was born. I enjoyed meeting Dr. Maxey: he does a great job of being informative and reassuring. He and Dr. Peeler make a great team. If you have a CHD baby, whether it’s HLHS or something else, you’re going to become really, REALLY familiar with an Oxygen Saturation monitor, aka O2 Sats, aka Sats, aka Pulse Ox. Oxygen saturation is a measure of how much oxygen the blood is carrying. If you hooked up a healthy adult or child to a sat reader, it will show the oxygen saturation as at or very near 100%. With Hypoplastic Left Heart Syndrome, this will not be the case. When Nolan was in NICU, I didn’t know anything about all the numbers on the monitor he was hooked up to. 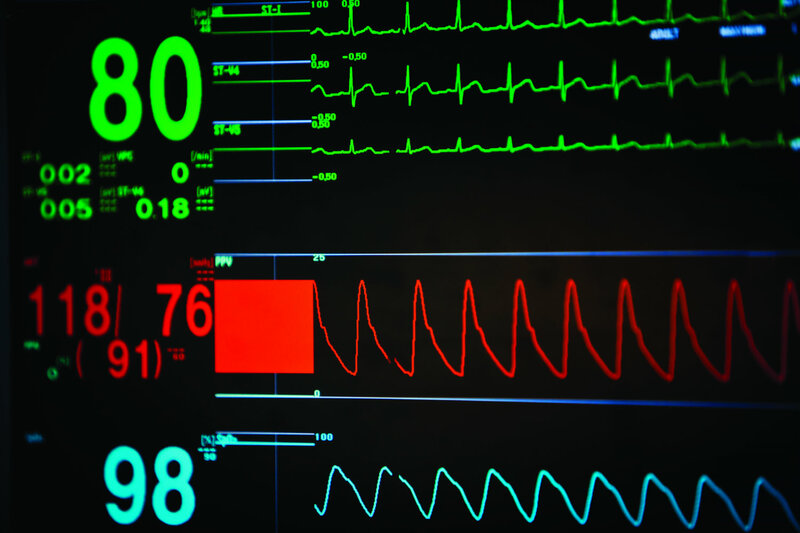 The nurse told me all about it: blood pressure, heart rate, and oxygen saturation. Sat rates are really important for heart babies, obviously: if they get too low, their breathing gets labored and their color can start to change. I remember in NICU that Nolan’s monitor was set to go off once his sats were below 75. And man did that thing go off…it’s an all-too-familiar sound to heart parents: boong…boong…boong…boong….BING…BING…BING…BING. And then you freak, and maybe the nurses come a little quicker, and typically everything is fine. The sat monitor used to make me nuts until one of Nolan’s doctors finally told me that the sat reader isn’t always an exact science: it may show low sats but that doesn’t always mean low sats: you have to look at his breathing and color. If it’s reading his sats at 60% but he’s breathing normally and his color is good, then it’s ok. Just give it a minute and we’ll see. Sometimes, though, it is very serious. So here’s another reason why reading sats is important: IT SAVES LIVES. How? It can really catch CHDs in undiagnosed babies before they leave the hospital. Imagine this: not every family finds out their baby has a CHD during the pregnancy phase. That’s terrifying. Even worse, some families never find out their child has a CHD and the baby dies shortly after birth or in one of those terrible sports-related deaths you read about in the paper. That’s even worse. 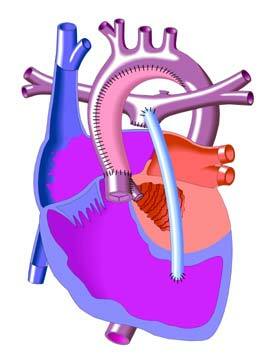 Not every hospital is equipped with a NICU, much less a staff that can adequately handle a CHD. Many kids are transported to hospitals hours away…so we’re lucky to have one of the best right here. Even so, a great way to find out about a potential CHD and work on getting help is through pulse ox screening for EVERY baby. This is a $5 test that takes like 5 minutes. That’s it. The crazy thing is, not every state requires mandatory pulse ox screening for every baby born prior to discharge. That’s changing, though, and it’s AWESOME. Think about how many lives can be saved with mandatory pulse ox screening across the country? I can’t imagine what it would be like to find out just after birth about a CHD, but I think it’s worse to never know and then lose your loved one because of it. So how does mandatory pulse ox screening become a reality? With you! Go to this site: http://pulseoxadvocacy.com/current-legislation/ and see if your state has passed a pulse ox screening law. If not, you can also find out how to contact your local lawmakers. Be serious about this: contact them. Saving these lives starts with YOU: so show that you care and do it. This law passed in NC and I was thrilled thanks to many heart parents who are fighting for their babies and those who are to come. Once Bekah was out of recovery, we were moved up to a room on the maternity floor of the hospital. It was weird because we were up there with no babies. Lots of time went by. We realized how tired we were: I mean we’d been up since 2:30am! So I fired off some text messages to people, updated my job (it was about 8am by this time), and then we decided we might as well rest. We both managed to get some sleep before waking up in hopes we’d be able to see our babies. 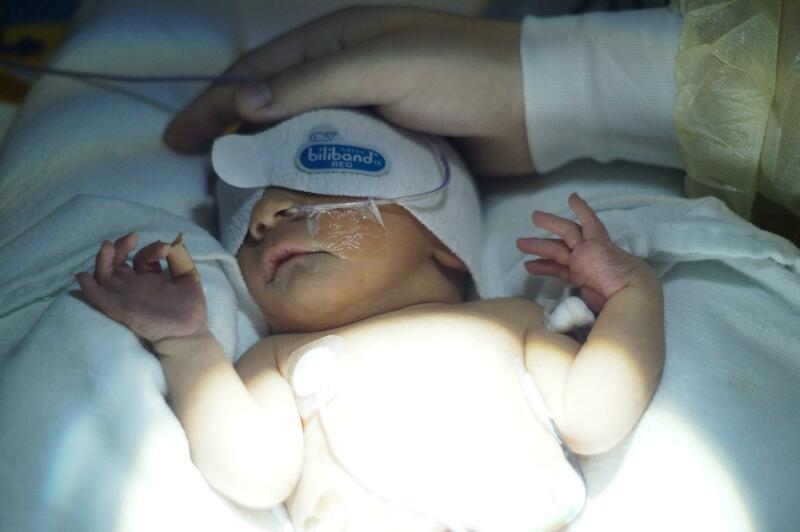 I finally decided to call the NICU to ask if they could be seen…they said yes. The unfortunate thing was that I had to go alone, since Bekah wasn’t able to get out of bed yet. So I walked to the nurse’s station with the all-important question: how do I get to the NICU? Man, those directions were bonkers: it was like go down 2 floors, take a left, then a right, then a right, then immediate left, then climb a mountain, shoot two free throws, eat 3 hot dogs….ok I’m exaggerating a tiny bit, but it was pretty crazy at first. I managed to find the NICU Nurse’s Station and I introduced myself. I was told to fill out a form indicating that I didn’t have the bubonic plague or anything like that, and they gave me a nifty Levine Children’s Hospital lanyard with badge holder to hold my parent badge and a list of NICU phone numbers (really helpful). I was instructed on NICU procedure: first check in at nurse’s station, then go to family waiting room where I’d have to do a 2-minute hand wash before putting on a yellow plastic gown, then I’d go out another door so I can be buzzed back into the NICU area…THEN I could see my boys. 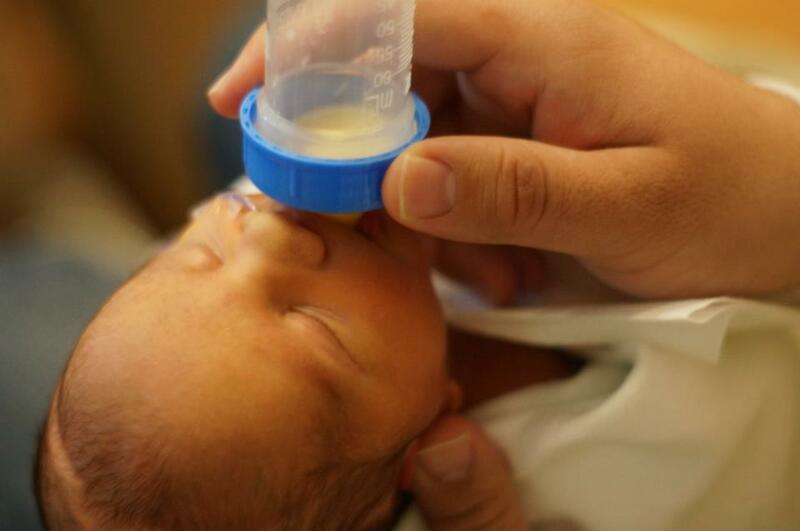 Now this is very important…if your baby ends up in NICU and you have to do the 2-minute hand wash, be sure you have a good bottle of lotion in your hospital overnight bag. Seriously. I’m not even talking ashy knuckles here, but when you hand wash so much at first (you visit, then your family comes so you wash again, then more family comes to see the baby so you wash again and again and again) your hands will BURN. I know mine did, and it was horrible, I have no shame in saying that cuz it sucked, big time. I couldn’t even put my hands in my pockets…and God forbid using hand sanitizer…WOOOO BURN. So yeah, lotion up! Eventually it gets better: I used Burt’s Bees hand salve. I know, some of you are like “So unmanly!” but just you wait. So back to it. I walked into the NICU and it was sorta like I remembered it: dark and quiet. I took a step inside and realized that I had seen my twins for such a short amount of time that there was no way I’d be able to know them by sight, so I didn’t know where to go. Luckily a nurse was there near the door and once I introduced myself she directed me straight ahead, where two little beds with heating elements were about 15 feet apart. My boys. I was happy to see them, but it so pained me to see them both there. First I went to Nolan, again afraid that I didn’t know what to expect. He was pretty zonked out looking all cute as if there was nothing amiss. Seriously, if you looked at him, he looked so normal. Amazing. His nurse came up and introduced herself and gave me an update: they did an echo on him right after birth, and – SHOCKER – he has HLHS. So she introduced me to his monitor, which displayed his pulse ox, heart rate, blood pressure, etc. 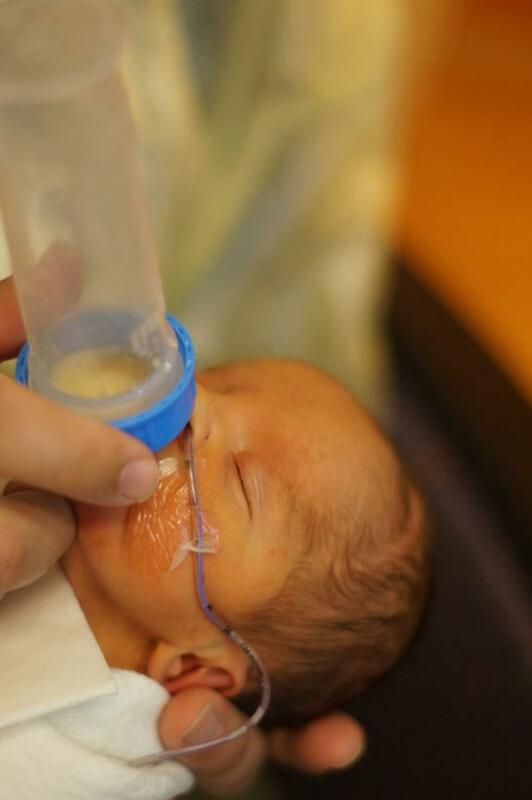 She said he was doing pretty well but wasn’t doing the best with bottle feeds, which is fairly common in CHD babies. I got to spend time with the little man and hold his tiny fingers and toes and talk to him. It was actually pretty soothing there in that quiet place. I asked if a cardiologist had been by and was told no, but that the nurse was fetching the NICU doctor to speak with me. While I waited, I walked over to see Grant, who was also happily asleep. I did notice, though, that he had a little oxygen still going in through his nose and this big (for him) bandage on his chest. Grant’s nurse came over and introduced herself and said that it looked like Grant’s lung had a buildup of fluid and had a little burst, but it was nothing major and they drained it. That threw me for a major loop because here I was expecting one medical issue, but with Nolan…and Grant had one too? The doctor finally came and said something I hear A LOT at the hospital and it pisses me off, “Hello Mr Perez. Is English a good language?” My reply, “What if it isn’t?” to which he laughed. I was not amused. Luckily for him, though, he was a nice guy and I liked him. He also confirmed that Nolan has HLHS and that the team at Levine Children’s Hospital is the best around. 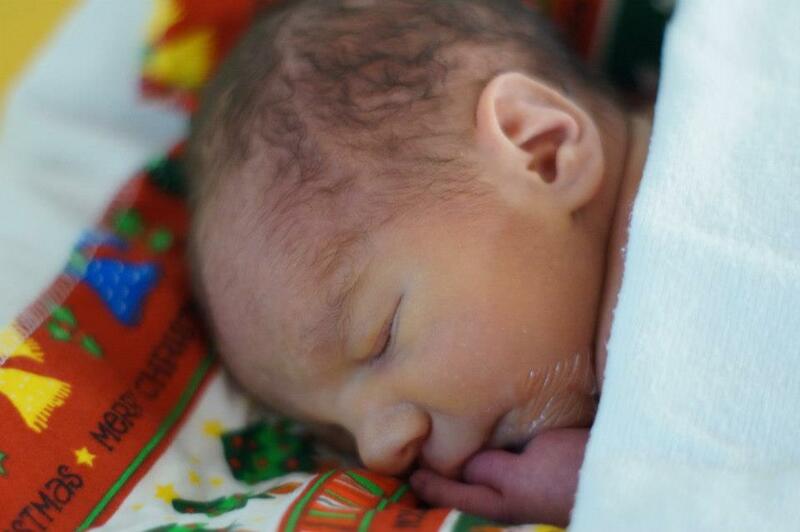 He also verified the info on Grant’s lung, saying he would be just fine aside from a tiny bit of jaundice. I didn’t have any other questions for him aside from asking when I would see a cardiologist and he said he’d check on it. Otherwise I Just wanted to spend time with the boys. I was a bit sad, though: I didn’t get to hold them and didn’t know when I could, and I wasn’t happy about the fact they were in the NICU in the first place. They were getting fantastic care, that’s for sure, but I wanted nothing more right then to have two perfectly healthy babies and be worrying about silly things like fitting them in the car. And it sounds stupid, but I was overly concerned with making sure I spent equal amounts of time with each boy. So I’d walk to Nolan and sit on this high rolling chair and just talk to him. Then I’d go over and do the same for Grant. It wasn’t until much later that I was able to take Bekah down in a wheelchair to see the boys. By then it was a pro at getting to the NICU. And it was really nice to see my wife get to interact better with the boys, even though she couldn’t hold them yet. A big question hung in the air, though: what would cardiology say? Will his surgery be tonight? Tomorrow? Next week?